X-Team DH7FB & DF2ZC QRV from EA9 Ceuta. They are started operation on 2 M band today. 15 Mar14:45 EF9LZ IM75 CQ 144.114 -EF9LZ- tx 1st . And it was the real problem: they could not hear no one, just sending CQ,CQ, CQ… I spent around 30 minutes, before understood, that much better to stop and wait for better conditions. Also I need to do some home job. 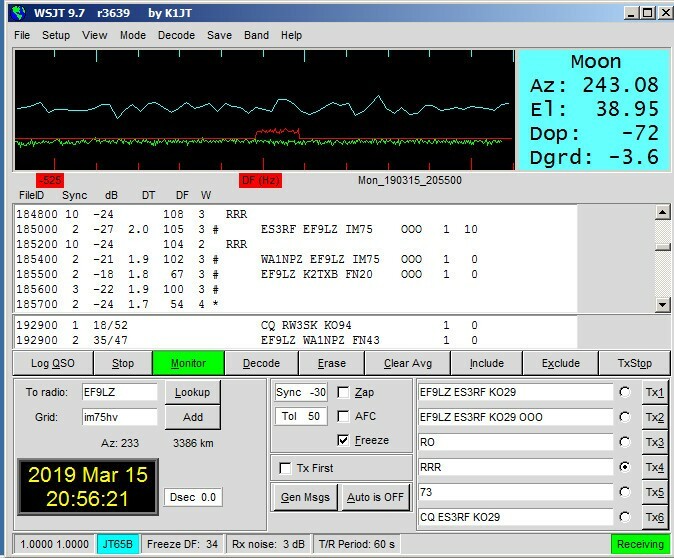 Next target – 70 cm EME QSO with EF9LZ. Very hope for a good conditions!